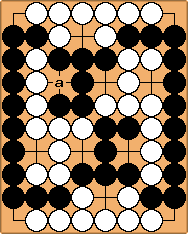 A cubic seki is, in theory, a generalization of normal seki such that every string involved in the seki has three liberties and neither player can gain by any play that removes any of the liberties. If we assume that each string in the seki is adjacent to and shares one liberty with exactly three adjacent groups, the topology of a cubic seki resembles that of a cube. 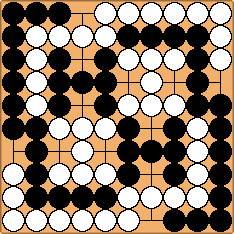 However, it may be that no arrangement of stones with this simple topology is a true seki. 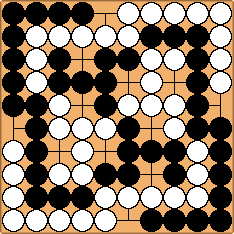 Other possible arrangements of seki with three liberties per string include adjacency to more than three enemy strings and sharing two liberties with one group. Having more than three strings adjacent to each string affects the stability of the cubic seki by making certain strings uncapturable after the capture of a group with which they share no liberties. These problems make good capturing race (semeai) problems. 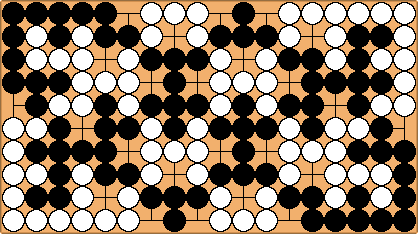 Either Black or White can profit nicely, capturing groups if he has the first move. 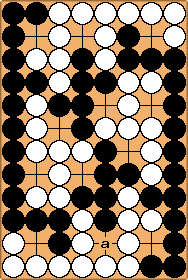 After removing the mutual liberty of one of his small groups, the other player can then capture that black group, but that creates a shortage of liberties that allows black to capture a larger group elsewhere.